The Lady Govs Softball team traveled to Jacksonville, Ala. for its final out-of-state road trip of the season. 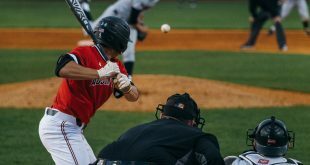 They played against the Jacksonville State University Gamecocks in a three-game Ohio Valley conference series beginning Saturday, April 16. 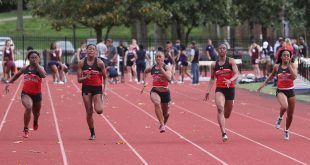 Jacksonville St. capitalized on five errors by the Lady Govs to win all three games of the series. In the first game, the Lady Govs (10-33, 5-16 OVC) trailed 2-1 with one out in the bottom of the fifth inning. Then, JSU’s Abbey Stepp reached on an error by Lady Gov senior second baseman Randal Davenport. Stepp advanced to second on a ground out to first. Next, Hayden Crawford smacked a single into left field that drove in Stepp. 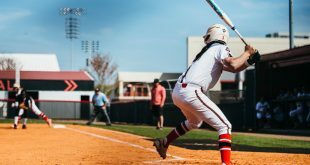 The Lady Govs’ pain continued when Kaycee Crow hit her sixth home run of the season to drive in two more runs for the Gamecocks (31-11, 16-3 OVC) and make the score 5-1. Junior outfielder Catie Cozart hit her third home run of the season to help the Lady Govs cut the Gamecock’s lead to 5-2 in the top of the sixth inning. However, this was as close as the Lady Govs would get to the Gamecocks. Tiffany Harbin (19-5) retired six of the final seven Lady Govs to end to the game. Junior pitcher Morgan Brewer (6-12) was tagged with the loss. She allowed eight runs (two earned) on five hits and struck out four. The Lady Govs produced only three hits in the game. Cozart led the way going 2-for-3 with an RBI. Davenport and senior infielder Tiffany Smith opened the second game with back-to-back errors. The Gamecocks took full advantage of the opportunity when Amanda Crow sent a three-run shot over the fence. The score remained 3-0 until the bottom of the sixth. Jacksonville St. added two more runs. The first was a home run by Sallie Beth Burch to open the inning. The second came on a single by Krystal Ruth. The Lady Govs had several chances to avoid the shutout. They left eight runners on base, including four in scoring position. The Lady Govs improved to five hits. Cozart was the only player to get multiple hits in the game. Junior Pitcher Ashley Bolda (3-9) earned her ninth loss. She allowed five runs on seven hits, earning two with two walks. The Lady Govs battled to a 0-0 tie until the bottom of the ninth in the final game of the series. In her second start of the series, Brewer subdued the Gamecocks, allowing only five hits in eight innings of work. JSU’s Harbin was equally impressive. She struck out 10 and walked one while keeping the Lady Govs hitless for the game. The pitching duel ended in the bottom of the ninth inning when the Gamecock’s Hayden Crawford hit a single up the middle. She followed up by stealing second to get in scoring position. The Lady Govs’ second error of the game cost them the win.